After verifying that the AutoDriver v1 shield was sound, I made a few changes to improve its functionality and ease of use. The biggest change was the addition of a switching power supply that can accept anywhere from 6 to 60 volts. 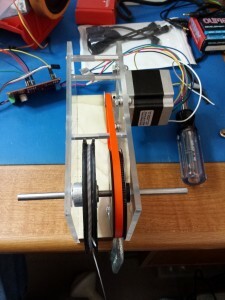 This will allow it to be powered directly from the same power supply used to drive the stepper motors and removes the need for a separate 5v supply. 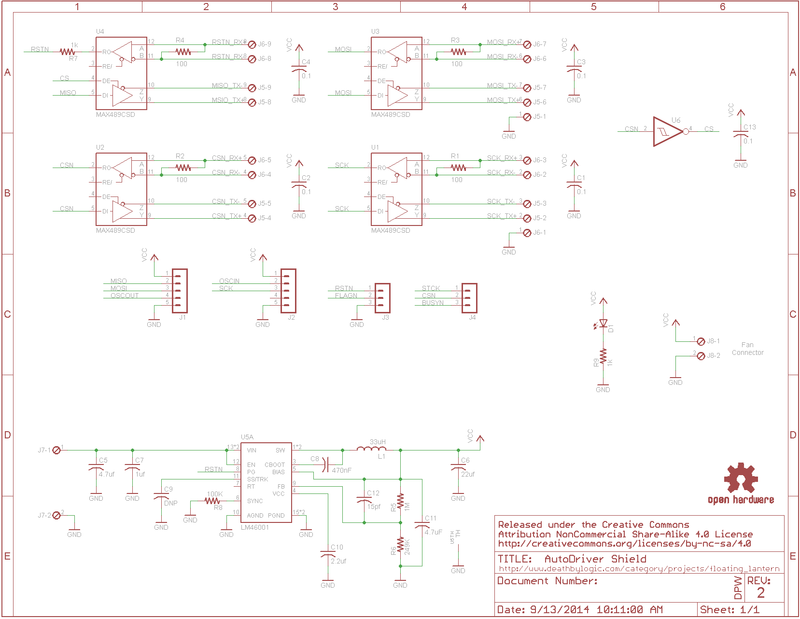 The second change was switching from a transistor to a single logic inverter to invert the chip select signal. During initial testing the transistor would not turn on or off quick enough to function properly, the single logic gate would guarantee the quick switching times needed. The final change was to reorganize the signals on the connector simplify connecting up the wiring between devices. 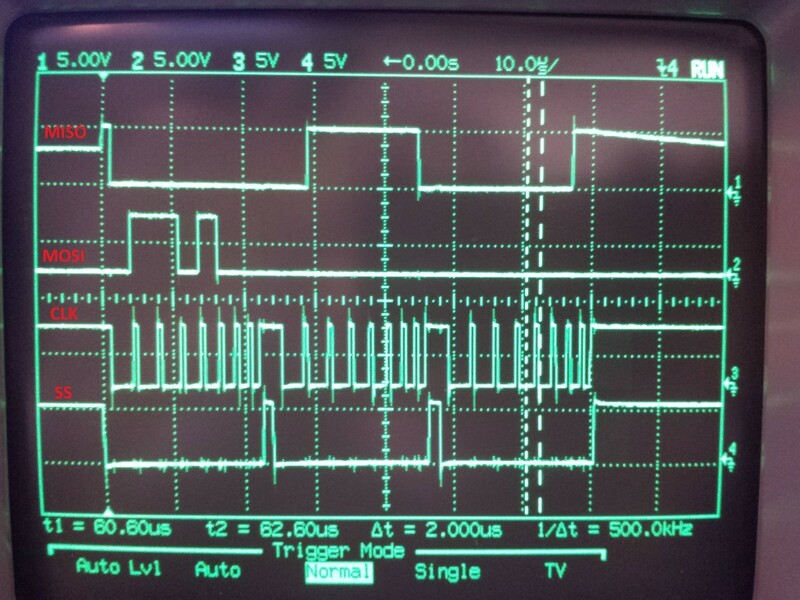 Arduino reading the status register from the AutoDriver via SPI over RS-485 with a 100′ loop of CAT5. 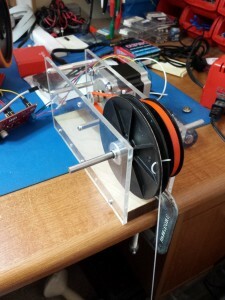 As part of the Large Scale Delta project I needed to control multiple stepper motors, each being over a distance of roughly 50 to 150 feet. To control each motor I chose to use the Sparkfun AutoDriver board which will drive up to 3 amps continuously and communicates over SPI. The AutoDriver, which uses STmicro’s L6470 chip, has built in current limiting, over current protection, stall protection, micro stepping and more but what is most important is that it has motion commands which handle the low level motion control aspects allowing you to command a position and it will handle the rest. This along with Sparkfun’s AutoDriver Library allow for easy and precise control of a stepper motor from an Arduino. While a SPI bus is easy to use over short distances it was not designed to run more than probably a few feet and definitely not tens or hundreds of feet, when you get to that kind of distance it introduces a few issues that need to be overcome. Last weekend I built one rig for testing my calculations for the large scale delta project and to verify the concept. The goal was to be able to lift 22 lbs vertically using an 125 oz-in stepper motor and an AutoDriver stepper motor driver, both from SparkFun. All the mechanical bits, timing pulley, timing belt, pulley and axle, were from SPD/SI. While I was able to determine that the general concept will work it failed to lift the 22 lbs. This was due to the timing belt and pulleys not being a heavy duty enough and skipping when the load got around 8 lbs, so on the next version I will go for better a heavier duty timing pulley. See below for a video of it in action. 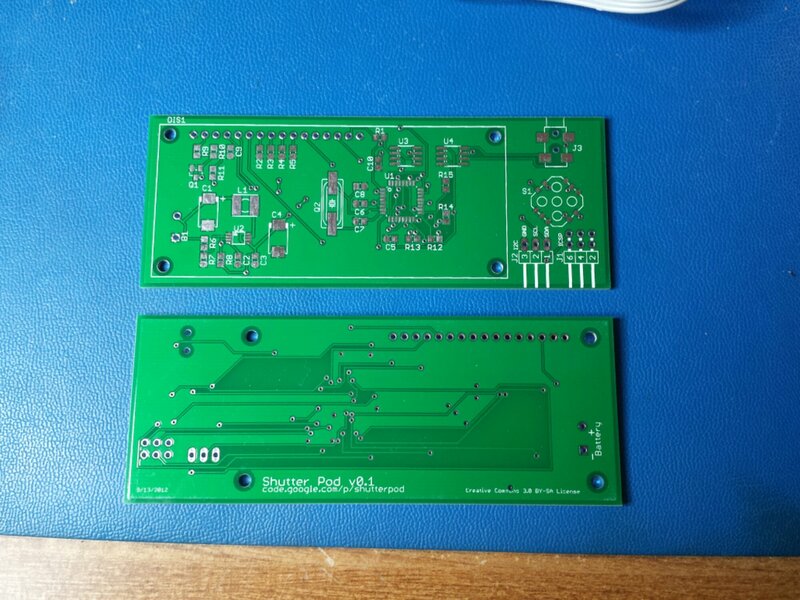 This post is only a few years late, but anyways here are a shot of the first version of the ShutterPod board.